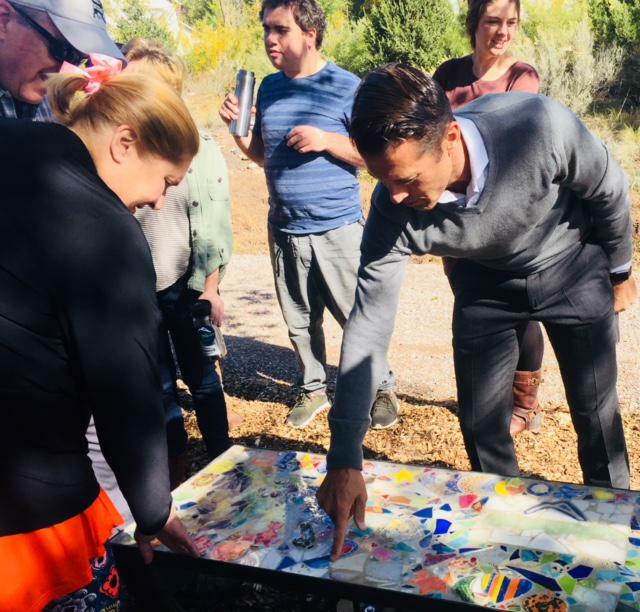 Carbondale’s Rio Grande ArtWAY, a collaboration between many community organizations, celebrated the first official installation yesterday. Ascendigo Autism Services together with Scavenger Industries built a bench in memory of Alex DeMeo. Raleigh Burleigh has this report. Upcoming community workdays for Derail Park are Friday and Saturday from 9 a.m. to 1 p.m. and work on the Latino Folk Art Garden is Saturday from 9 to noon. More information is available here. CEO and President for Ascendigo Autism Services Peter Bell shows the mosaic bench.